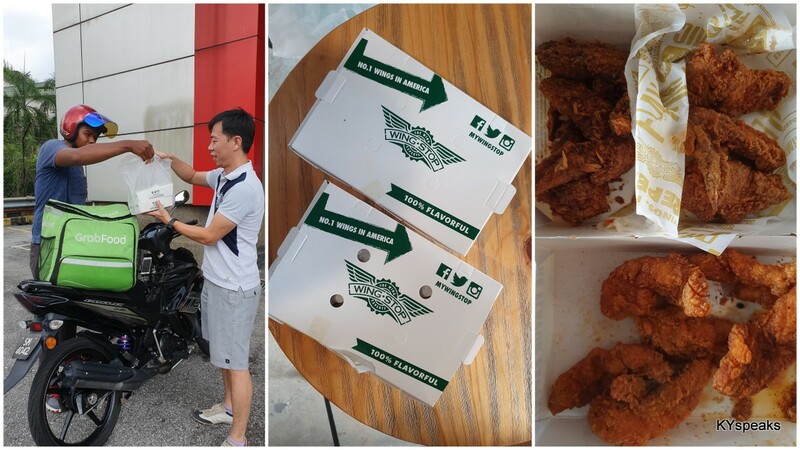 How many times have you gone up to Genting Highland, had all the fun with the less than thrilling rides, the cooling air, and losing money to the late Uncle Lim, just to be disappointed with the dining options at the end? (they’re usually either lousy, or too expensive). Most of the time, I avoid this by stopping over at Hock Lay, Ulu Yam, or just give up and get something fast from Mary Brown since paying extra for McD and KFC just doesn’t seem right. I know, I know, Mary Brown is cheaper at Pudu, but they get preferential treatment since they are local. 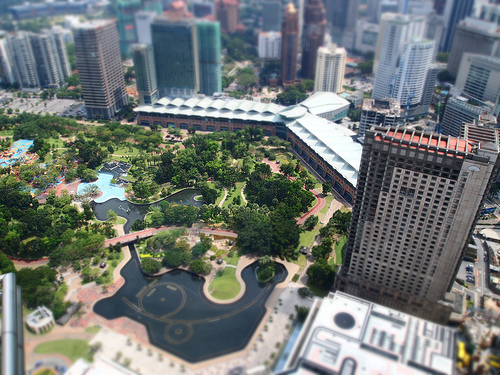 And then there’s Gohtong Jaya. I used to think that at half way to Genting, the restaurants at this area must be slaughter houses like those on top of the mountain. I couldn’t be more wrong, this is actually the place where people who lives in Genting goes to eat, and the price is actually more than reasonable. We chose to eat here since Kim’s dad (who used to run a restaurant) gave his approval. 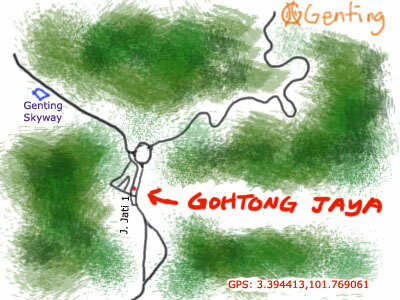 The 8 of us went up to Genting several weeks ago, and we stopped by Gohtong Jaya for a late dinner. Six of us were eating, and we ordered 4 pretty diverse dishes to go with rice. Funny how a restaurant located 920 meter above sea level offers seafood, but that is exactly what happens here. Our clay pot seafood was an amazing dish, with plenty of sea cucumber, clams, mushrooms, prawns, peas, and fish maws in a very fragrant and addictive broth. I loved it! Another dish that I would positively recommend is the clay pot egg plant with salted fish (brinjal, aubergine, whatever you wanna call it). This unorthodox combination turned out to be very good, a bit salty, a bit sweet, and really yummy. Then of course, we ordered a plate of vegetable for the color and a false sense of a complete healthy meal. It was decent, and the vegetable’s probably planted nearby. 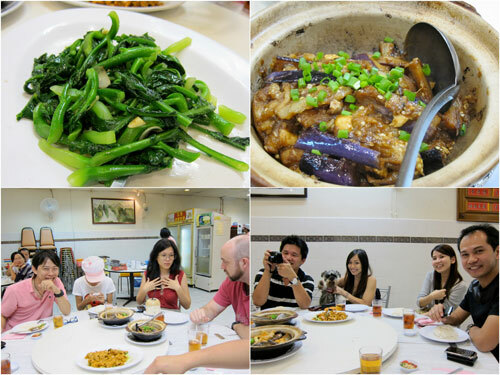 The dinner for 6 (Kim and Gareth was on diet), came to RM 88, or less than RM 15 per pax. 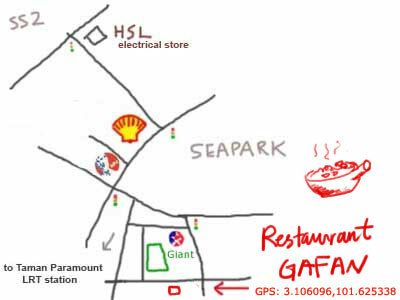 Now who said you can’t get cheap and decent meal near Genting? 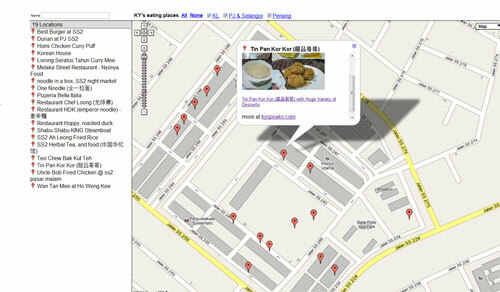 After a lot of hard work updating all the reviewed places (over 346 locations and counting) on google map, a bit of tinkering with the feed map programmed by Sheryl, here I present you with the first version of searchable food map on kyspeaks! The page is located at map.kyspeaks.com and also accessible by clicking the “searchable food map” banner on the right. The map is not perfect, the way it looks right now isn’t exactly consistent with the blog theme, and there are still features (like routing, category, etc) to be added, but it is a start. 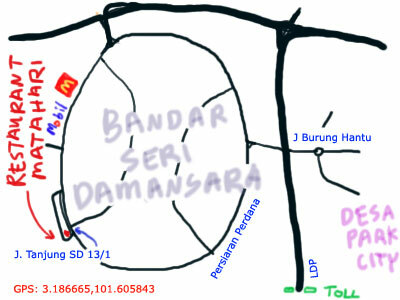 A few days ago, I decided to head up to Bandar Seri Damansara to join Kim and Gareth for dinner. 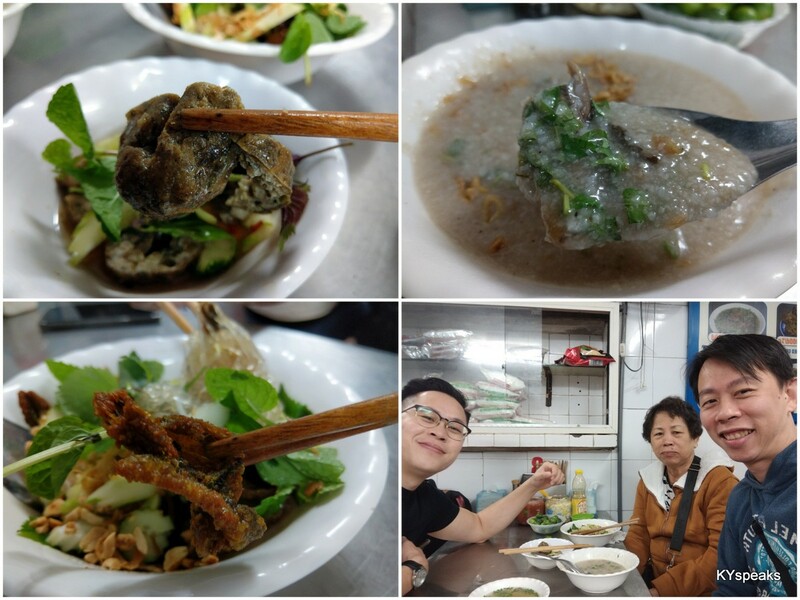 I usually avoid going there in the evening, but since Kim tempted me with the promise of “very good pork tripe soup“, I made an exception that ultimately proved to be the correct decision. 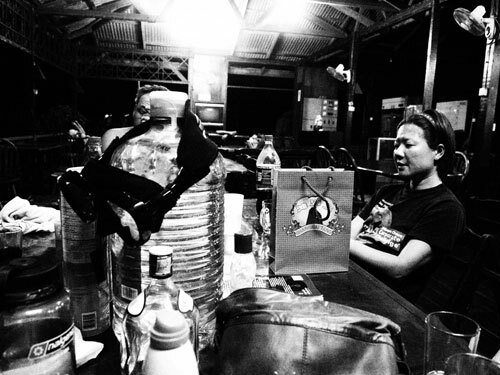 Kedai Kopi Matahari with pork innards soup at night! 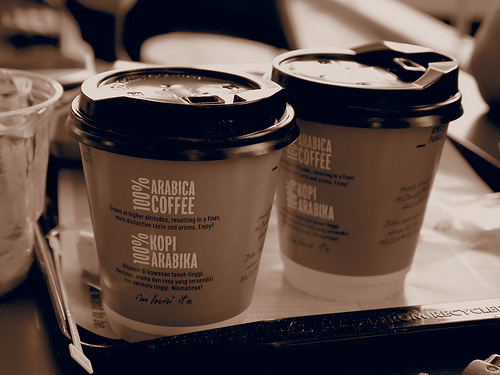 Kedai Kopi Matahari is arguably the biggest and busiest kopitiam this side of Bandar Seri Damansara, there’s about a dozen different hawker stalls with most of them serving different foods in morning/afternoon and evening/night sessions. 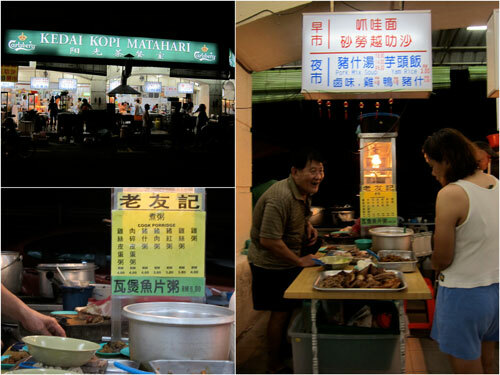 As fate would have it, our table happened to be situated right next to the stall I was most interested – “lou yau kei” (老友记) – serving braised or soup version of pork innards + meat + yam rice. I went to the cheerful uncle at the stall and ordered a bowl of soup with everything in. 10 minutes later what I got in front of me, for mere RM 9, was a bowl of very fragrant and peppery soup with plenty of coagulated blood, 3-layer pork, tripes, intestine, and something that looked & tasted like pork tongue. It was delicious! The accompanying yam rice was very good too, with plenty of yam cubes to chew. The dinner turned out to be much better than I had anticipated, the availability of coagulated blood really made my day. Kim also swore by the curry mee at the same restaurant, Gareth and Kerol too were happy with their Hokkien mee and wantan mee. I should return to the same restaurant and try out other dishes, there’s even laksa sarawak in morning/afternoon session, intriguing. 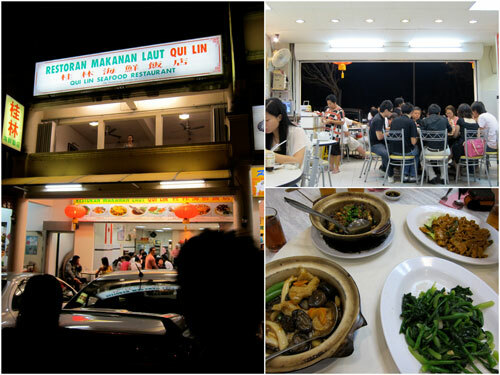 Taman Paramount is one of my favorite locations for dinner for the simple fact that it is pretty close to where I stay, and it doesn’t hurt that the area (including seapark and ss2) is littered with a lot of good old fashion eateries. One one of our routine “what should we eat for dinner, how about just drive around till we find something?” exercise, we spotted this newly opened clay pot rice place that looked pretty decent, and thus decided to check it out. 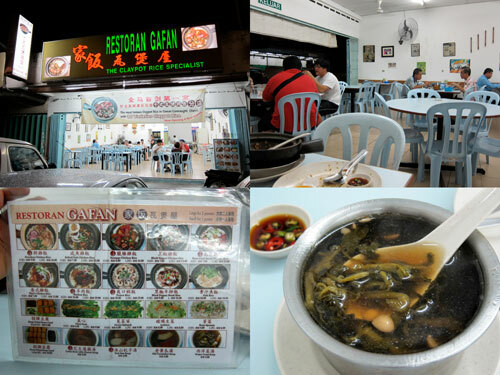 As it turned out, this Restaurant Gafan is a branch of the much reviewed clay pot chicken rice with the same name in Taman Connaught. If it’s good enough for masak-masak , it’s good enough for me. 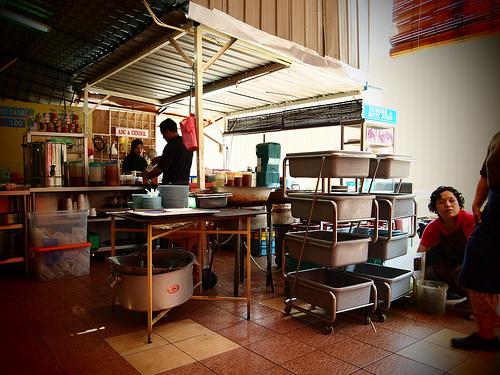 The restaurant has a pretty basic kopitiam style set up, with plastic tables and chairs under plenty of ceiling fans. 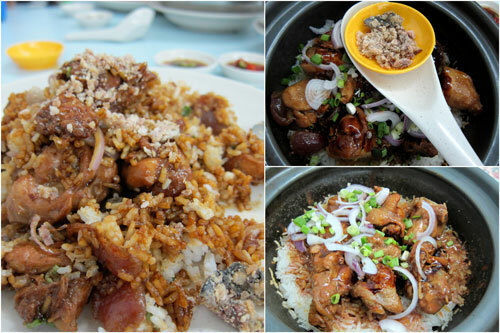 There’s 10 types of clay pot rice on the menu, 6 of them with chicken, remaining four with lamb, prawn, beef, and fish. They also offer a few types of vegetable, soup, and tofu to go with the main course. I tried the basic clay pot chicken rice with lap cheong (with addition of salted fish) and also chicken with fermented tofu at this place, and so far both versions came out rather good (RM 7-10 per serving). I also like the fact that they give you a tower towel to hold the super hot clay pot. 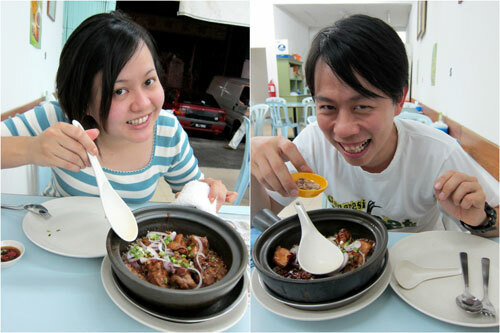 Kerol’s enjoying her clay pot chicken rice, and so was I! 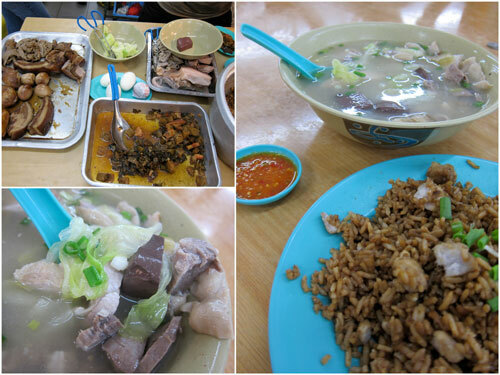 Do try the steamed soup (RM 4) here too. 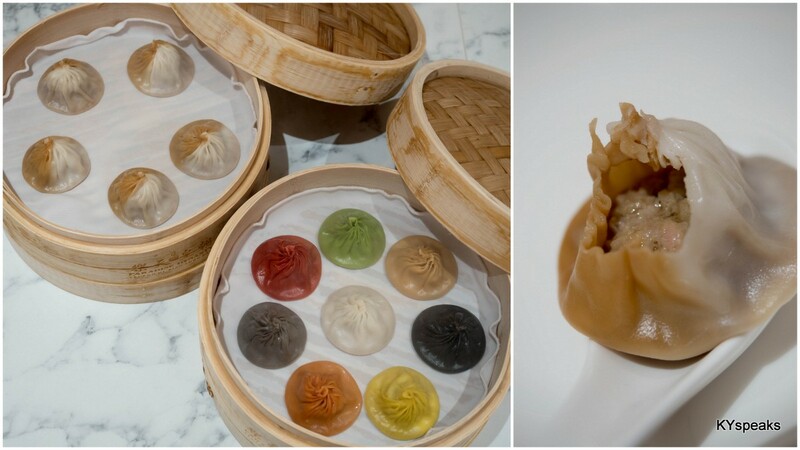 They are quite delicious, and sipping soup makes waiting for the freshly cooked clay pot rice a lot less boring. Business is still pretty slow (at least at dinner time) but I do hope this place stays. 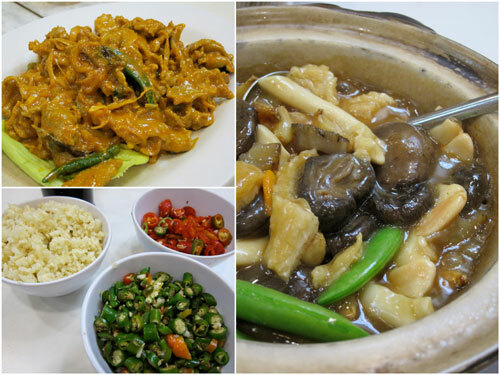 Other clay pot chicken rice worth checking out includes Hong Kee at Petaling Street, Busy Corner and Khoon Kee at DJ, and Veng Soon at Old Town. 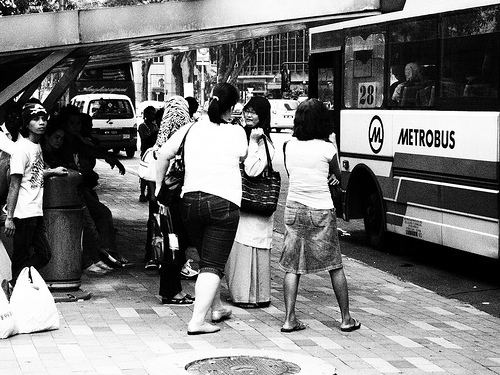 One very nifty feature of Olympus PEN E-PL1 that I reviewed just a while back is this ART filter function. Basically with this function, you completely remove the need for Photoshop at least 95% of the time. All the sample photos shown are straight out of the camera without any post processing. Efficiency! Switch the dial to ART mode on the camera, and immediately you are presented with the screen that looks like the above. Using the up/down button, choose the desire ART filter, click OK, and start shooting like normal. The photos will turn out dramatically different from the usual way. There are six different art filters to choose from. The above was shot using the Sepia filter to give it a bit of a rustic look. One of my favorites would be the pin hole filter. Some might view the on-purpose vignetting a cheap way to make photos looking artistic. To me, if it looks good, why not? I love it. 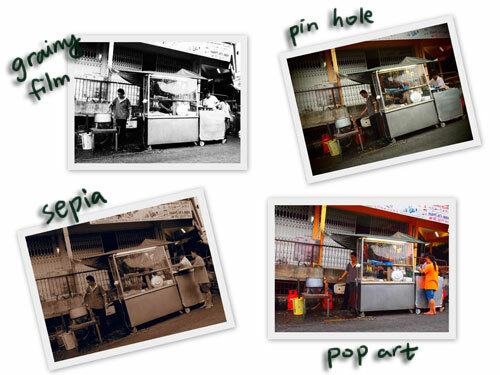 Here’s another pin hole effect, on the left is without filter, and on the right you can clearly see the dramatic effect. The plus point is that you can set the camera to record both original jpeg as well as jpeg with art filter at the same time. Of course, there’s always the RAW + jpeg format too if you want to retain even greater control. The diorama filter effect is kinda cute, taking from an elevated vantage point, you can make the scenery looking as if it’s a scaled model, very cool. I kinda like the grainy film filter too. I tend to shoot quite a lot of street photos (when I’m not shooting food, that is), and the B&W shots it generates works pretty well. Very usable. The smaller size is a huge advantage when doing street photography, unlike a huge SLR, this isn’t as imposing and people tend to not notice it as much. Not to mention the lighter camera won’t strain your arms nearly as much. There’s also the pop art filter that makes colors really stand out, think balloon party. pop art filter with lord of the rings! 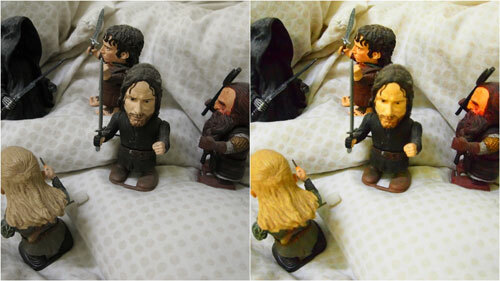 Lacking a chance to attend any party lately, here’s a demonstration of the pop art filter effects with Lord of the Rings midget figures. You can see the amplified color saturation in this filter to make bright colors stand out more. Here’s four different types of art filter and their amazing effects in a nice little collage to sum it up! Pretty cool isn’t it? Oh! and these function works on VIDEO mode too! Check out this little video demo that I made while at Tenggol island. There’s a slow motion effect with PIN hole, and a fast forward effect on Diorama filter when you apply them on video mode. The others will be running at normal speed, makes for pretty cool video, no? 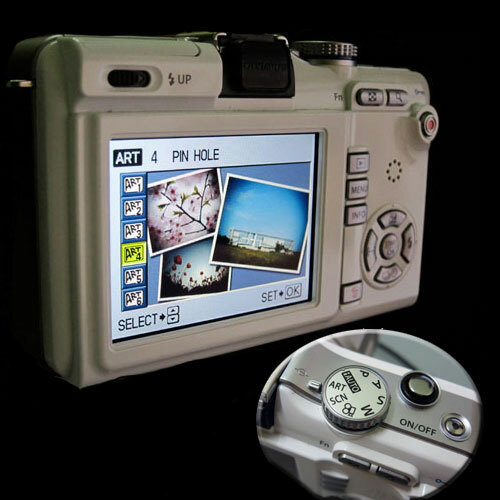 If you’re thinking of getting this baby, do also check out the Evolve contest for a chance to win an Olympus PEN E-PL1! The contest runs until end of April, 2010. Check out evolvewitholympus.com.my for more!